Carp generally spawn in April through August depending upon the climate. They have a highly effective reproductive system. A 4kg fish could produce up to 1 million eggs, 90% of these are fertilised and more than 80% hatch. The sticky eggs are deposited over submerged objects. No parental care is given to eggs or young. By the time the fish reaches 1/3 of an inch in length, it begins to actively feed. The development of carp eggs and sperm are directly affected by water temperature, the availability of food, the amount of dissolved oxygen in the water, and the increasing length of daylight. The eggs ripen when the female carp’s pituitary gland stimulates the release of gonadotropin hormones. In temperate zones, carp become sexually mature in two years and spawn in the spring. In tropical regions, they may spawn more than once. Carp spawn usually one time, but the population may spawn over the entire season. If food is scarce, fish will progressively spawn a few eggs at a time. 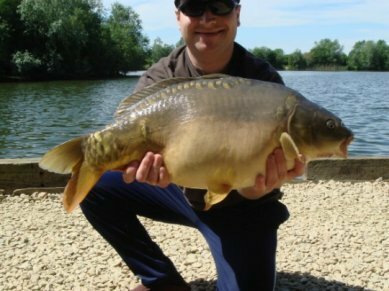 Carp spawn in the spring and early summer in weedy, grassy, shallow areas of lakes and watercourses, usually about 2-3 feet deep. They prefer to spawn when the level of water is rising. Heavy rain-flood conditions usually trigger furious activity as carp wallow and splash, making a noise that can be heard for some distance. All this splashing and physical activity is designed to spread the adhesive eggs. Spawning carp are usually not interested in eating, but post spawn carp are. Pre- and post- spawning carp can be found in the rolling waters where the spawning happens. Anglers should look for post-spawn carp for the best fishing during this period of the carp’s life. Many carp populations appear to be self-regulating. Adult fish in dense, highly competitive populations eat their own eggs and larvae. When adult numbers decline, the survival of young carp is greatly enhanced and a strong new generation emerges. Male and female carp spawn by swimming side by side. A female Carp has up to seven males fertilising her eggs at any one time, although three to four males is average and spawning may occur over several days. The female carp releases her eggs into the water. The amount depends on the age, size, health and the number of times a carp has produced eggs. Carp sperm has a high motility which lasts for 30-60 seconds. Usually, one sperm enters the micropyle, fertilizing the egg. The micropyle closes, the egg absorbs water and enlarges, and then the egg becomes sticky. The amber, orange or yellow eggs hatch in three to eight days, depending on water temperature. They have a yolk surrounded by a two-layer membrane. The eggs float in the current without the protection of the adults for 24 to 30 hours before they hatch. The small, sticky eggs are deposited randomly, dispersed widely in the shallows and they become attached to submerged weeds, grasses or other substrate. For the first 2 to 4 days, fry ingest the yolk sac, which has all the necessary nutrients for survival. By the time they have reached a length of 8mm, they will have completely absorbed it. Before the yolk sac is used up, the carp inflate their swim bladders with air, increasing their ability to move around. The fry then feed on microplankton and water fleas. If hatching comes too close to winter, the young carp fry do not have enough time to build up reserves of fat before winter sets in, and they die. The young fry tend to remain in shallow water with dense plant growth to protect them from predators and being swept away by the current. During this time, they learn how to coordinate their movements and flee quickly from danger. When they grow larger, they leave the shallows and head to deeper waters to form schools. Growth is fastest in warm water that is rich in food. Carp can reach 0.9kg (2lb) and approx 15cm in length in a year. They continue to grow at that rate. Anonymous. No date given. Aquaculture Curriculum Guide. URL: http://aquanic.org/publicat/govagen/ncae/carpc.pdf. [Accessed March 22 2007]. Australian Society of Limnology. June 2000. ASL Newsletter. Volume 38. Number 2. URL: http://www.asl.org.au/aslnews/v38/aslnews_v38n2_articles.htm. [Accessed March 25 2007]. Carp Anglers Group. 2007 The Spawn: How Long Does It Last? URL: http://www.carpanglersgroup.com/forum/index.php?showtopic=15840. [Accessed March 25 2007]. Chumchal, Mathew. 2002. Cyprinus carpio. Animal Diversity Web. Dawson, Peter. 1998. Carp-l FAQ - Carp. URL: http://www.carp.net/faq/cfaq_2.htm#c2_1 [Accessed March 25 2007]. Smith, Benjamin. 2004. Carp (Cyprinus carpio L.) Spawning Dynamics and Early Growth in the lower River Murray, South Australia. Doctoral Thesis. University of Adelaide. URL: www.sardi.sa.gov.au/ [Accessed March 28 2007].